The Intercept has identified eight AT&T facilities across the United States which are allegedly being used by the NSA to monitor internet users' emails, social media posts and internet browsing. The centers are known as 'peering' facilities' and processes data from both AT&T customers and those of other U.S. internet providers, as well as telecoms companies from Sweden, India, Germany and Italy. The deep-in human entity of which we speak is called in the Scriptures the spirit of man. "For what man knoweth the things of man, save the spirit of man which is in him? even so the things of God knoweth no man, but the Spirit of God" (I Cor. 2:11). As God's self-knowledge lies in the eternal Spirit, so man's self-knowledge is by his own spirit, and his knowledge of God is by the direct impression of the Spirit of God upon the spirit of man. One of the most liberating declarations in the New Testament is this: "The true worshippers shall worship the Father in spirit and in truth: for the Father seeketh such to worship Him. God is a Spirit: and they that worship Him must worship Him in spirit and in truth" (John 4:23, 24). Here the nature of worship is shown to be wholly spiritual. True religion is removed from diet and days, from garments and ceremonies, and placed where it belongs - in the union of the spirit of man with the Spirit of God. From man's standpoint the most tragic loss suffered in the Fall was the vacating of this inner sanctum by the Spirit of God. Man by his sin forfeited this indescribable wonderful privilege. Christ, will enter only by the invitation of faith. "Behold, I stand at the door, and knock: if any man hear my voice, and open the door, I will come in to him, and will sup with him, and he with Me". (Rev. 3:20). By the mysterious operation of the Spirit in the new birth, that which is called by Peter "the divine nature" enters the deep-in core of the believer's heart and establishes residence there. "If any man have not the Spirit of Christ, he is none of His" for "the Spirit itself beareth witness with our spirit, that we are the children of God" (Rom. 8:9,16). Such a one is a true Christian, and only such. 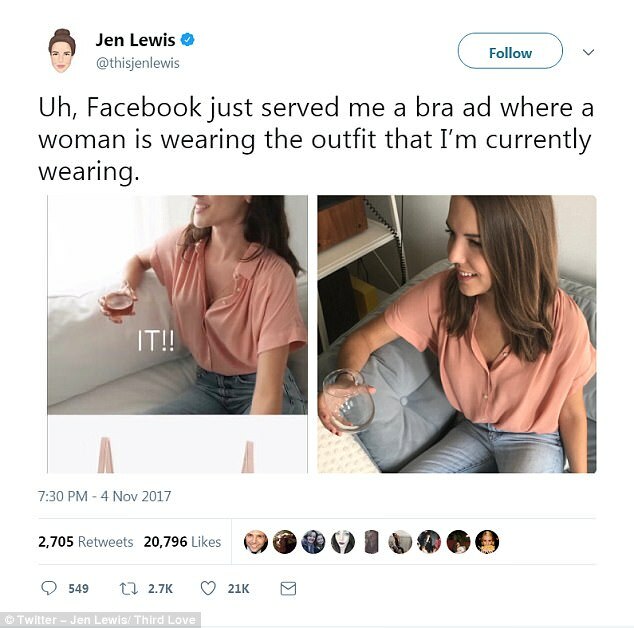 A woman was left stunned when an advert showing a woman dressed in an identical outfit to her popped up on her phone. Jen Lewis, from Brooklyn, spotted the bra ad from Third Love featuring a model wearing a pair of pale blue skinny jeans and short-sleeved pink blouse. The writer and designer recreated the model's pose and posted the near-identical pictures side-by-side on Twitter, where they have since gone viral with more than 20,000 likes.